It’s been a nice week so far with my son off from school for Passover and Spring Break. No early morning wake ups or rushing out the door needed! Although, the weather has been PERFECT so running in the morning has been a pleasure. I ran in shorts and a t-shirt yesterday! Anyway, I believe today is Wednesday (really, I am so thrown off) so let’s take a look at what I ate on Monday. I’ve actually been rotating breakfast again! I really do go through breakfast phases and right now, I think I like switching between some days oatmeal, some days English muffins with peanut butter. I usually have half my English muffin before I run and then half right after I get back home and have showered. I had enough salad ingredients left to make a quick salad for lunch while cooking for Passover. 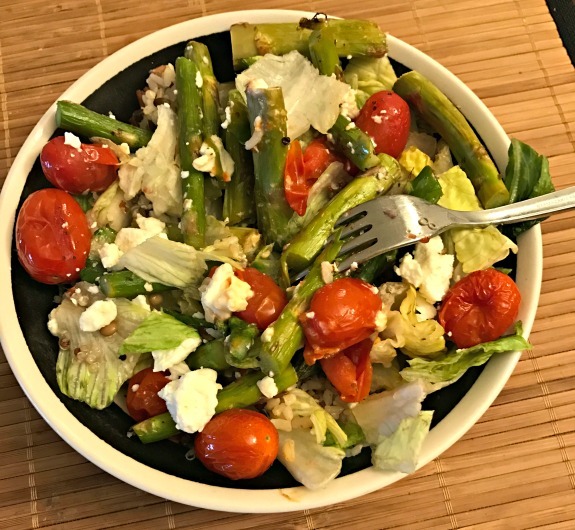 In this salad is roasted asparagus, tomatoes, brown rice, quinoa, lentils and feta cheese. We went to my parents for the first night of Passover. I am always responsible for roasting the vegetables and potatoes. I don’t even try to get creative anymore for Passover, I just stick to the basics and what works. Pictures from actual dinner didn’t happen but there were the traditional foods like matzoh, gefilte fish and brisket. 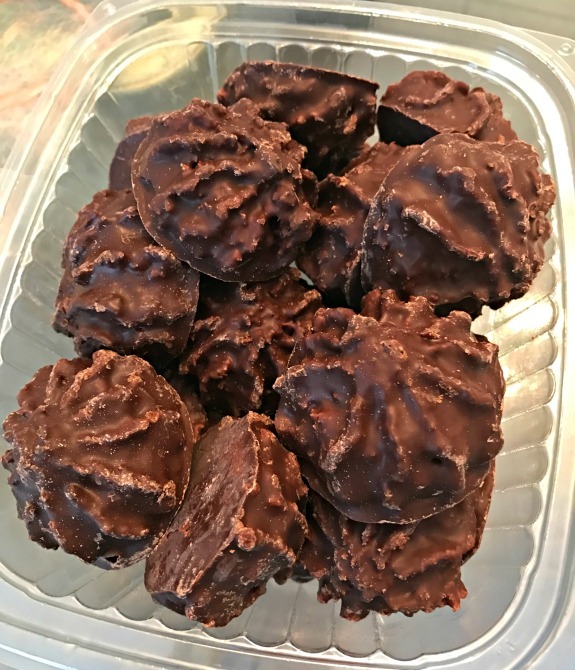 I really could have skipped straight through dinner to dessert for the chocolate-covered macaroons. My dad got a mix of chocolate-covered chocolate macaroons and chocolate-covered chocolate chip macaroons. I can’t even say which I prefer. Some years I like the chocolate macaroons and some years I prefer the chocolate chip. As long as they are chocolate-covered, I don’t really care. Do you eat the same thing for breakfast every day or do you like to switch things up? What is your favorite breakfast to eat? If you celebrate Passover, do you have a favorite type of macaroon or other Passover dessert? I was eating frittatas for breakfast every day for a LONG time (years?) but last week I switched to smoothies. I suddenly got so tired of the same breakfast and needed a change. Plus I like being able to add random stuff to my smoothies. 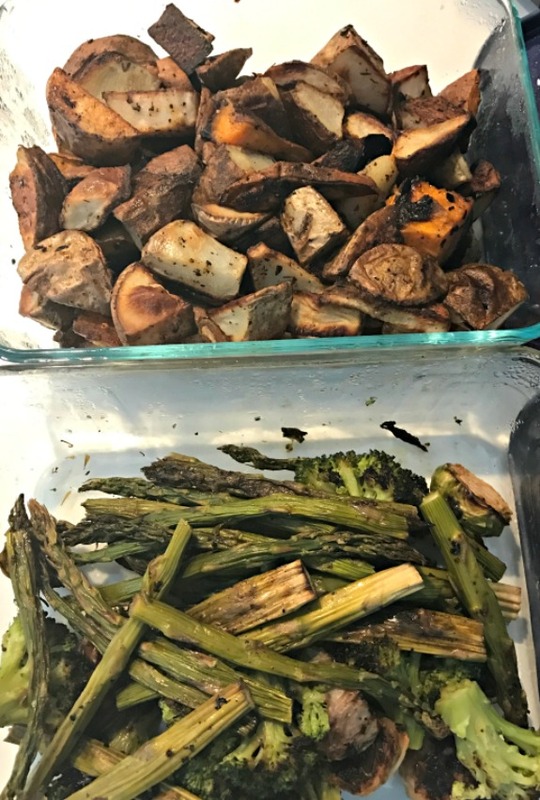 Your roasted veggies always look so good! I go through phases with smoothies for lunch. it usually hits me in the summer! I admit I do eat oatmeal nearly every day for breakfast. I used to eat egg whites but I’ve switched over this winter! And I love it! I’m a plain or chocolate macaroon girl. As long as it’s not dark chocolate, I’m a fan! I would say that most days of the year, I eat oatmeal too! I eat oatmeal every weekday for breakfast, but I like to switch it up on weekends to bagels, whole grain pancakes, eggs, or something different. Those chocolate macaroons look so good! the macaroons are definitely delicious. YUM! My mom made chocolate chip meringues. TO DIE FOR! I will definitely be making more of them ASAP!!! Happy Passover to you too! I don’t love matzo either although I did already have a matzo pizza lol. We do not keep it. I did when I was first married and then slowly gave it up lol. It’s not that I eat a lot of bread anyway, it’s more the whole no peanut butter thing that gets me. so I think it depends on background but legumes are not considered kosher for Passover. However, I do think Sephardic jews do eat legumes. so many rules! Your salads get me everytime. They always look amazing, totally need to recreate this one. And what is it about breakfast that we all have such a hard time switching up routine with. I’ve been trying to eat a few different things, but always end up going back to oatmeal. 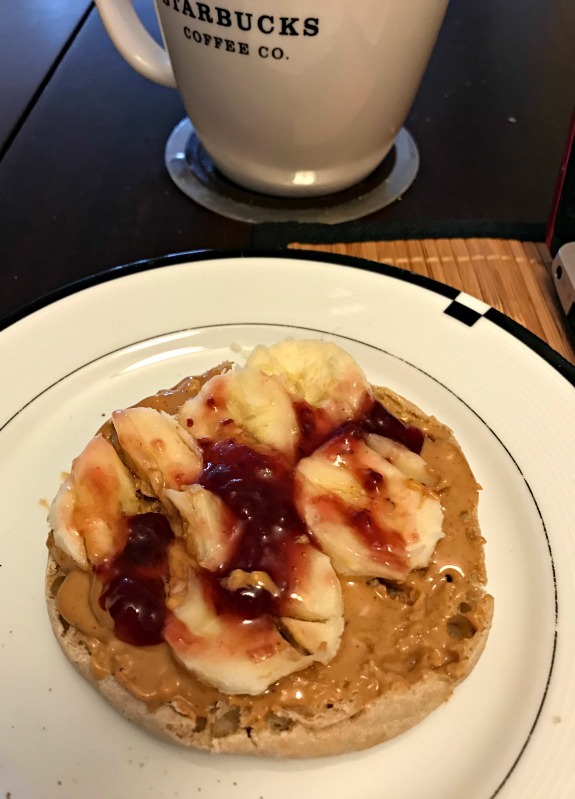 I always end up back to oatmeal too although right now, I am definitely enjoying the English muffin with peanut butter mornings! I end up eating the same things all the time. I eat eggs for breakfast almost everyday. Im so glad the weather is warming up everywhere!